Fear the Walking Dead is part-spinoff and part-origin-story for the popular AMC series The Walking Dead based on the graphic novel of the same title by Robert Kirkman. A brief internet search will turn up plenty of content about the cable series and the graphic novels. Basically, it tells the story of an unknown disease that turns the recently dead into wandering cannibals seeking flesh to eat. Cast photo from season four of AMC's The Walking Dead. Image taken from Walking Dead Obsessed, a Wordpress site created by a 50-year grandmother and fan of the show. I am predisposed toward wanting to love the next iteration of the world created by The Walking Dead. The stories are compelling and the questions stark: What would I do if I woke up to a world gone mad? Would I have what it takes to survive? Each character provides insights into how to respond to these questions. Both the original series and the spinoff borrow a lede from the zombie flick 28 Days Later (2002) by having a main character wake up into this world. The viewer follows the slowly unfolding realization that the definition of yesterday's reality no longer holds true. I like this way of entering the story, although it is not geared to a fast-paced action thriller. The "explosions" and "chases" are inward as the mind races to figure out what is going on, and the heart palpitates with what is waiting around the next corner. Notice in the first scene of the premiere of Fear the Walking Dead (FTWD) how this theme of light emanating naturally from the outside plays continually against artificial light of the interiors. A later scene in the abandoned church uses a hanging light bulb to great effect. What is real and what is not? What is living and what is not? Think of the artificial lights of the hospital room and equipment and the helicopter searchlights at night. This dawning realization is lived out by Nick, the main character/drugged out prodigal. Nick in a conversation with Travis in the hospital room furthers the metaphor: "Either it was in the powder [the drug he took] or it came out of me." What is the origin myth that we're talking about? If this show lives up to its predecessors, the story being told is probably not the one we're thinking of. The first words spoken in the FTWD premiere take place in a church, as Nick shouts for "Gloria." We find out he is searching for his companion, a fellow junkie. But, it's obvious, as it goes with this universe and its story, there is more to it. A sickened, lonely human wandering through a dilapidated sanctuary seeking someone else. The character moves toward the safety of being close to someone else. The religious themes are reinforced by outer ilght piercing the darkened hallways as Nick moves through the church. The next scene after the opening credits is a house--a lived in, cared for building--that is truly a home. A woman moves through the house, starting in the bedroom, picking up laundry, while a man works on a kitchen sink. The first conversation between the Maddie and Travis has them bantering about the broken pipe. Travis is under the sink. Maddie: "How's that working out, babe?" Maddie: "Ye of no faith. The plumber's number is on the fridge." It's a small bit of dialogue but important in that it shows the posture of the two characters: unwillingness to believe any sort of fixing actually works, and a willingness to try fixing it, regardless. In the hospital later, Nick spoke to his mom for the first time after an accident. Nick: "L. A. is not a pedestrian-safe city." NIck: "Just trying to be the light." Not only does this echo the continuing religious themes, but it might be a clue to Nick's role in this series. He seems to see things before others do. Nick told Travis about the procedures of the "junkie communion" with a story that ends with a perverse reversal in the "eating of flesh." A religious theme, just not conventional. On the return trip to the abandoned church, the lopsided cross moves across the screen followed by "Why?" spray painted on a column in the sanctuary. The religious themes are not so subtle in this first episode. As with the original series, this world turns churches into places where, as Maddie put it, "bad things happened." The first fifteen minutes are set the following locations: an abandoned church, a domesticated yet distressed home (mostly the kitchen, the place of most familiarity), a busy hospital, a car on commute to work, and a packed high school. These scenes represent fundamental institutions in American society. All of these institutions are bound to be infected and disintegrate like a corpse. What will be lost? Orange juice for breakfast, hot showers every morning, running water, leisure for creative arts, mobile phones, reading novels, following conspiracies on the internet. If all of this withers away and disappears, will there still be a human will to survive? Will there be a reason to survive? I use the language of survival because it is so critical to the story line of the original series. There are survivors and those that cannot survive. Remember the dialogue between Abraham and Glen in the library? Remember the scene between Calvin and Nick in the drainage basin with skeleton figures tagged on the concrete wall? Some live, and some die. As Jack London reminded high schoolers, we have to learn the desire to be the ones to not die. in the hospital, Nick describes the process of "junkie communion" and how his experience with Gloria went counter to "normal"
in watching the video, a teenage girl acknowledges one of the first rules learned by survivors facing walkers when it is shot in the head by the police. The code eventually breaks down. The institutions crumble, become warped, and then must be patched back together. Warning signs for what is coming appear in a few short minutes. Travis told his students, "It's about Man vs. Nature. Nature always wins." The gurgling patient beside Nick goes into arrest. A series of lost children posters. And, then, the walker-like homeless guy in the park. All of these scenes depict the sheltered, ordered life in contemporary America, and the fleeting and sometimes dangerous struggle of this existence. The hapless father figure in Travis Manawa, played by Cliff Curtis, calls the ex-SO/mother of his only son about an upcoming custody weekend. Travis tells his son that "we're just trying to build a family here." He moves from this failed conversation to one with his new signficant other, Madison, the mother of the drug addict, played by a favorite actor of mine Kim Dickens, with much more success in finding resolution. Travis continually tries to fix these family situations in the face of doubt. In the truck on the highway, Maddie is not sure she wants her son to come home. The impetus of the show so far is that the character conflicts are so plausible. The decomposition of the family is a key plot point as well as how well people can keep it together; as much as The Walking Dead is about the composition of fictive kin while trying to keep it together. Watching the viral video in the teacher's lounge, Artie, the school principal, said, "This is why we need to stay at home." Contrast this talk of "home" with Cal and Nick meeting in the diner. Cal said to Nick, "I got you" and called him "brother" even though it's not certain how true it is. The interactions between Travis and Maddie are the core to the show--a study of contrasts: certain doubt and dubious belief. Notice the small moments between these two. The image above just before answering the phone, and again in the hospital before Maddie leaves for school. Master actors creating the ideal image for the kind of people that could survive anything. Alicia the daughter has a side plot with a boyfriend showing the fragility of family relationships and continual search for belonging somewhere to someone. The connection between her and her brother Nick seems like something I'd like them to explore in future episodes. Tobias, a geeky conspiracy freak, always in danger of being bullied, becomes another challenge to the notion of belonging. Who belongs to whom, who can be trusted, and does it matter in long run? The answer is yes--all of this belonging matters in terms of survival, in developing the desire to not die. The episode demonstrates the versatility of working through domestic strife in a rapid exchange of words in the hospital room between Travis, Maddie, Nick and Alicia at 8:10-9:10. It is a great piece of work between these actors. This is followed by the phone call between Travis and his ex and his son, which Travis called "something resembling love." Later, Nick's story told to Travis about what happened the morning of the first scene, being together with Gloria and then waking up to the horror of being left but not alone. Put this up against the mother and son embrace in the drainage basin, when there was no dialogue, just powerful imagery. Good stuff if you think about it a little bit. It's a better show than most "first to post" reviewers thought. Notice the image of portals and fences throughout the first episode. Nick moving from room to room in the church, Maddie making her way to Nick's hospital room through a series of doors, the scanner at the school entrance, the fence surrounding the church, the wall by the park with the lost-child posters, the wall alongside the street in front of the homeless guy in the park, the school bus entry door, the exit ramp where the viral video is taken, the car doors on at least three vehicles. and the portal for the Los Angeles River drainage basin. There seemed to be a major revelation to the characters every time they passed through a portal. A thought crossed my mind. 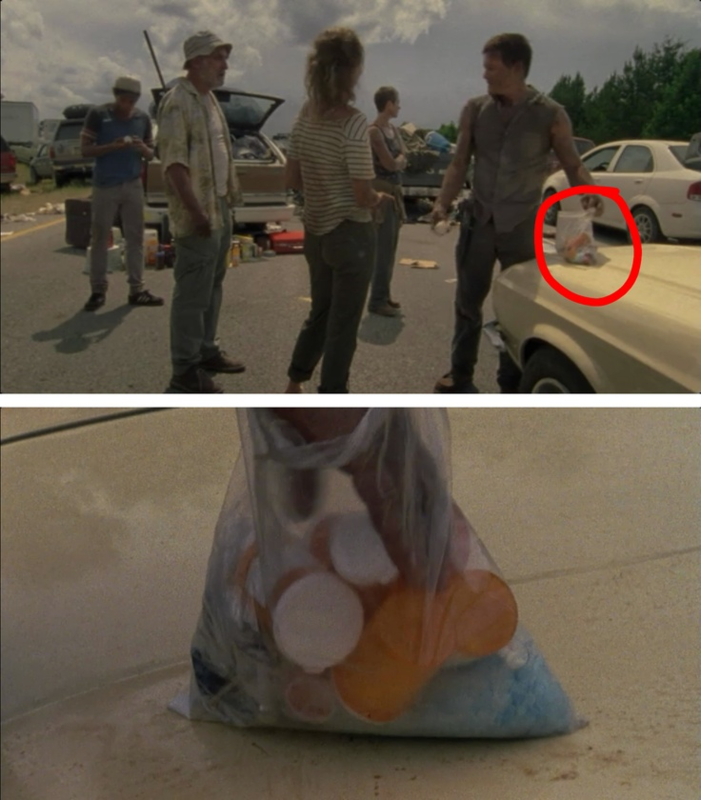 Long-time fans know about Breaking Bad's blue meth Easter egg showing up in The Walking Dead in Merle and Daryle's contraband. The first walker revealed in The Walking Dead universe has crystal (meth) blue eyes. Is there something to it? Not to mention the pervasive drug use that is tied to the main character Nick, and the possibility that he had been given tainted goods by his dealer. Could bad drugs be a cause of the diseased walkers? It's important to remember to look for throwaway lines. It's in these morsels that much can be heard. Travis, Nick, and Maddie are in the truck driving through the drainage basin portal. They are talking about Nick's drug dealer. Travis: "We don't know what we're dealing with here, Maddie." So, is there drug abuse in Maddie's past? Is it the motivation for her to go into high school counseling? The reason her kids have an unmentioned father? Is there a connection between a Los Angeles high school counselor and a high school chemistry teacher in Albuquerque? The first episode poses a few interesting questions, and makes for a fun few weeks while the rest of the story rolls out.